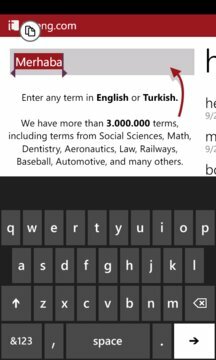 Turkeys most high-toned Turkish - English online dictionary, Tureng is now extending its database to the Windows Phone users. Having more than 3.000.000 English and Turkish words and phrases, classified into categories by the field of their usage, Tureng Dictionary, aiming to give the most accurate result in the fastest way, now provides the users with audial pronunciation option to hear the terms searched in the dictionary in three different accents, British, American and Australian. Our database is enhanced daily with the user suggestions and the additions primarily based on the “unfound’ words, phrases and idioms translated by those who are experts in their fields, Tureng forum users (http://forum.tureng.com) and the Tureng translation team. Provided by Tureng Ltd, established with the collaboration of the translators with more than 10 year-translation experience, Tureng Dictionary, being determined to carry on its studies unfalteringly, is a free online lexical service specifically targeting to those working in translation, education, engineering, business world and foreign trade industries. 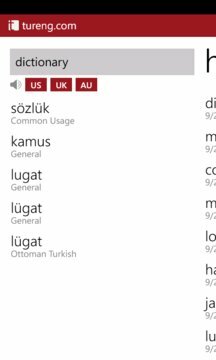 Türkiye’nin en kaliteli online Türkçe-İngilizce sözlüğü olan Tureng Sözlük, artık Windows Phone 7 kullanıcılarına da hizmet veriyor.